On the 24th of March 2015, at the prestigious Nursery & Garden Industry Australia Awards, the hardy and compact native hedging plant,Grey Box™ Westringia fruticosa 'WES04' PBR was awarded Plant of the Year for 2015. 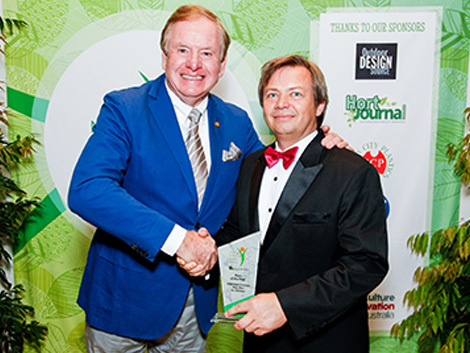 Robert Prince, CEO of the Nursery & Garden Industry Australia, said judges were extremely impressed with plant's environmental qualities. Grey Box™ Westringia has been an outstanding seller for nurseries around Australia. It provides great colour contrast with distinctive year round foliage and masses of beautiful white flowers from September to May, delivering an impressive eye catching display. 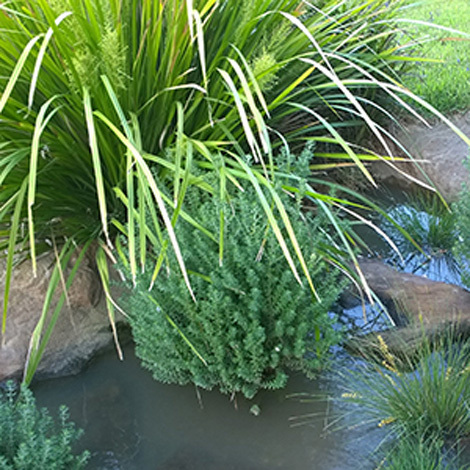 It also gives a particularly striking contrast when planted with Ozbreed Aussie Box® Westringia. One of the qualities that makes Grey Box™ Westringia stand above the rest is its incredible robustness, tolerating drought, frost, humidity and one of the unique characteristics is that unlike the majority of Westringia varieties the Grey Box™ plant will also tolerate periodic wet feet. It has been tested in extreme cold, down to -9 degrees Celsius and has performed well in QLD, NSW, VIC, SA, TAS, WA and ACT. It is best when planted in full sun to light shade and is very well suited to most soil types including sandy and heavy clay soils. Like other Westringia, it will also tolerate the harsh salt laden winds of coastal areas. It is wonderfully versatile in application and as an Australian native if far more tolerant of the diverse Australian climate. Grey Box™ Westringia provides a brilliantly tough, faster growing and lower maintenance alternative to exotic box plants, such as English Box, for small formal hedges and when mass planted, will give a sea of very compact, tidy, naturally 'ball shaped' plants. It is also an ideal choice for garden borders and is a wonderfully low maintenance plant for containers. The adaptability of the Grey Box™ plant doesn't end there; it has proven in Green Roof trials to work extremely well and will work in Green Roofs across most of Australia. It is a highly recommended native plant for Greenwalls for most states across Australia and due to its outstanding tolerance for periodic wet feet, it is the only Westringia variety recommended for Raingardens. With its super compact form, beautiful foliage and exceptional versatility, Grey Box™ Westringia makes the perfect plant for landscapes and gardens alike.